Custom wood-epoxy boat building in sail and power as well as classic and antique boat restoration, generally to about 50’. We offer a number of designs to suit a variety of needs: Classic and “retro” sail and power boats, high-performance sail and power boats, “Green” power boats with a variety of power options that are economical to run. And we are a resource for custom yacht design services as well. 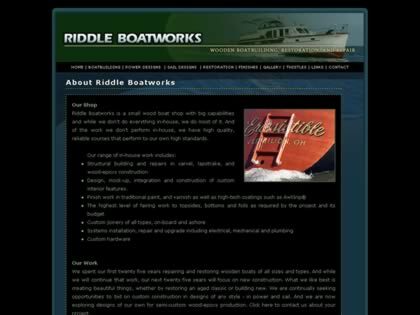 Web Site Snapshot: If available, above is a snapshot of the Riddle Boatworks web site at http://www.riddleboatworks.net as it appeared when this site was added to the directory or last verified. Please Note that Boat Design Net has no involvement with the above web site; all content and images depicted in the above thumbnail are the property and copyright of Riddle Boatworks unless otherwise noted on that site. Description: Custom wood-epoxy boat building in sail and power as well as classic and antique boat restoration, generally to about 50’. We offer a number of designs to suit a variety of needs: Classic and “retro” sail and power boats, high-performance sail and power boats, “Green” power boats with a variety of power options that are economical to run. And we are a resource for custom yacht design services as well.